Deal Alert: Hyperlite Mountain Gear Backpacks and The Shell Jacket on Sale! Once a year Hyperlite Mountain Gear runs a solid sale and it is that time! I reviewed the HMG 3400 Ice Pack a few years ago and it is still one of my most used packs for ice climbing and winter mountaineering. You can find my original review of it here. You can see the whole line of HMG backpacks here! I also got a chance to review The Shell which is the most rugged ultralight waterproof/breathable I have ever tested! Find that full review here! I’ve you’ve been considering picking up one of these award winning backpacks or this industry changing jacket now is a good time to save some money! 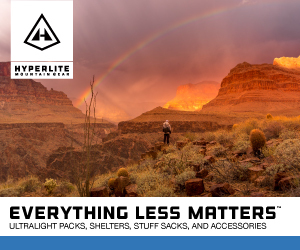 20% off site-wide on Hyperlite Mountain Gear!!! Affiliate links help support this blog at no additional cost to you. Thank you!